They're not the students strolling across the bucolic liberal arts campuses where their grandfathers played football. They are first-generation college students-children of immigrants and blue-collar workers-who know that their hopes for success hinge on a degree. But college is expensive, unfamiliar, and intimidating. Inexperienced students expect tough classes and demanding, remote faculty. They may not know what an assignment means, what a score indicates, or that a single grade is not a definitive measure of ability. And they certainly don't feel entitled to be there. They do not presume success, and if they have a problem, they don't expect to receive help or even a second chance. Rebecca D. Cox draws on five years of interviews and observations at community colleges. She shows how students and their instructors misunderstand and ultimately fail one another, despite good intentions. Most memorably, she describes how easily students can feel defeated-by their real-world responsibilities and by the demands of college-and come to conclude that they just don't belong there after all. 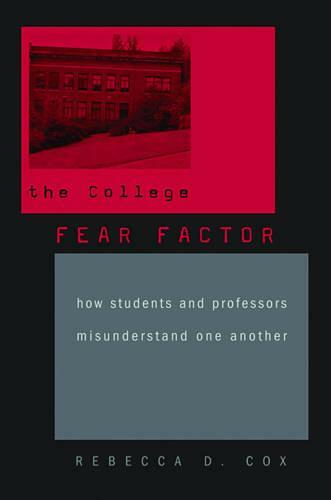 Eye-opening even for experienced faculty and administrators, The College Fear Factor reveals how the traditional college culture can actually pose obstacles to students' success, and suggests strategies for effectively explaining academic expectations.